Whenever I manage to wake up early a few days in a row, I feel great about it. But I don’t do it consistently. I spend a couple of days waking up before 6 AM and enjoying a good spurt of writing, and then I find myself slipping back into later bedtimes and later wake-up times (~ 7 AM) or hitting the snooze. Clearly there are some things I still need to tweak about my system. 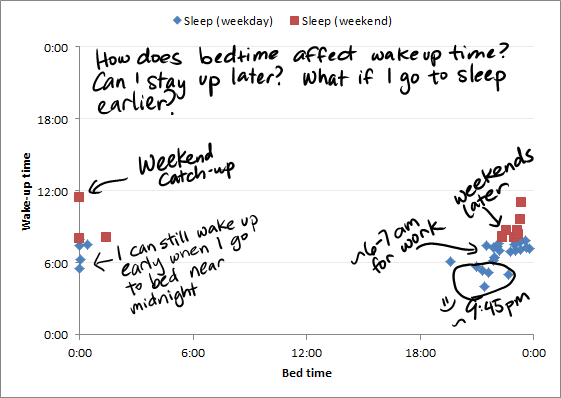 Average sleep time for wake-up times before 6 AM: 9:45 PM, which is a bit of a stretch but is doable. Is it a matter of getting to bed earlier? Would it help to disable snooze entirely? Would it help to set our programmable thermostat warmer in the morning, or promise myself a hot cup of tea when I get up? Would it help to set my snooze interval to 5 minutes instead of 10? What if I give up on waking up early and instead shift to more of a night owl schedule? Advantage: can sync up with W-. I’ll need to figure out how to give my personal pursuits the creative energy they need, though.